I used MentorMob to create a playlist of resources for using ThingLink in the classroom. Be sure to check out the final step in the playlist to view Donna Bambach’s collaborative slideshow, Interesting Ways to Use ThingLink in the Classroom, for a growing collection of great ideas contributed by ThingLink users. A wiki is a website that allows members to easily edit and contribute content. Wikispaces is a teacher and student friendly tool that supports multimedia for collaborative learning. Wiki’s can support student-driven project based learning experiences to help students develop super skills for the 21st century: creativity, collaboration, communication and critical thinking. 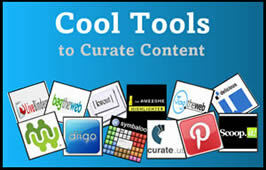 I used Thinglink to create this interactive graphic which illustrates my favorite features available in Wikispaces. Please scroll your mouse over the graphic to access the resources. 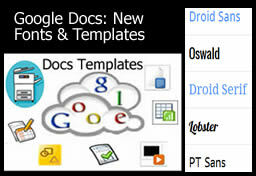 Google Docs is making the transition to Google Drive and with that they have recently announce some improved features for Docs users. Most notably is the addition of 60 new templates and 450 new fonts. Click on the name of the font. 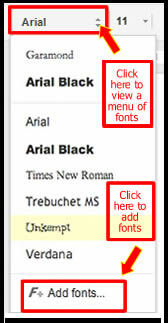 Scroll to the bottom of the list of fonts and choose Add Fonts. Choose the fonts you want to add. Note: You must be signed in to your Gmail account to preview and access the templates. Searching for information and making sense of it is a process that involves critical thinking. Google has many tools to help students sift through the overwhelming abundance of web content, but those tools are often not utilized by students and teachers. Providing students with strategies that makes it easier to find relevant information more efficiently is a skill we need to teach our students. 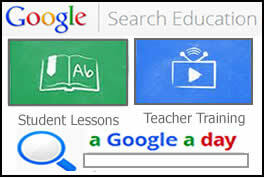 Check out this video to learn more about Google Search Education.